Oceanflow's E35 device was installed on its pre-laid moorings at Sanda Sound on the 7th August 2014 and will remain on station until the summer of 2015 when it will be brought back to port for inspection after approximately one year of survival sea trials. 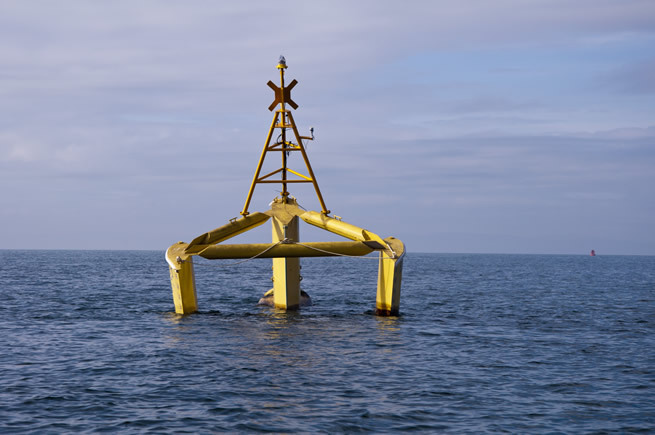 The semi-submerged platform's motions, heading control and survivability have so far surpassed expectations and the company is looking forward to completing the grid connection and exporting the power to shore once the subsea power connection is completed. The Sanda Sound test site was chosen for its combination of strong tidal flow and harsh wave climate in order to fully validate the operability and survivability of the Evopod™ low motion hull form. The unit is monitored from Oceanflow's shore station near Southend, South Kintyre. 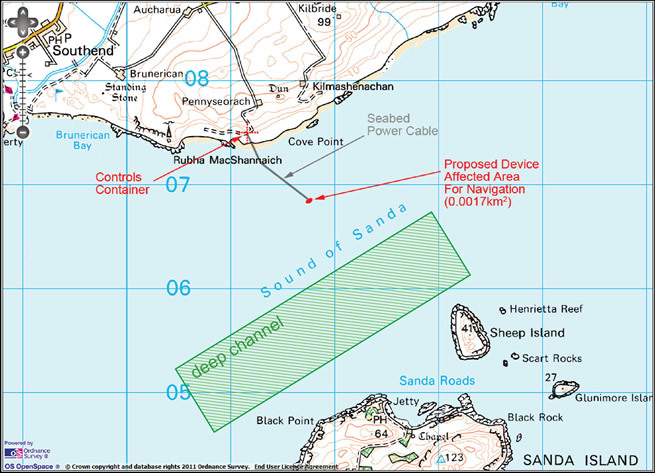 Oceanflow has completed two years of surveys, consultations and environmental monitoring activities resulting in a licence from Marine Scotland to deploy the E35 test device at the Sanda Sound site which was awarded in August 2012. A seabed lease was signed with The Crown Estate in January 2013 to secure the site for the exclusive use of Oceanflow until 2020. Energy from the device will be transmitted ashore via a seabed cable which will be connected to the grid. The grid extension down to the foreshore to connect with our device was commissioned from SSE and completed in 2012. Oceanflow acknowledges the contribution from Scottish Enterprise towards the build and deployment of the 1/4th scale Evopod in Sanda Sound through their WATERS (wave and tidal energy support) scheme. WATERS is part financed by the European Structural Funds through the Highlands and Islands European Regional Development Fund. 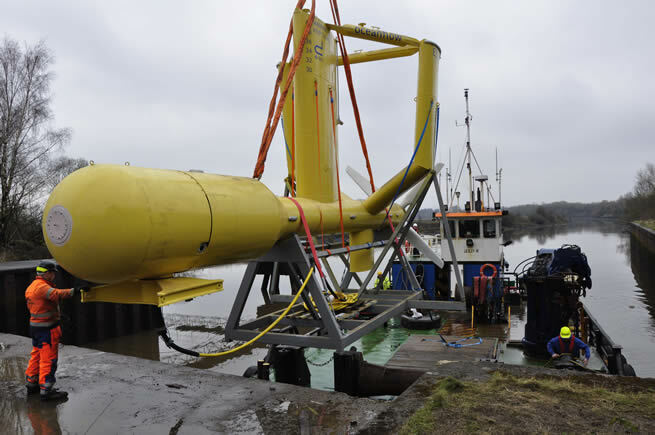 The device, which has a nominal output of 35kW is based upon a smaller scale unit that was tested at Strangford Narrows near the Portaferry Marine Laboratory between 2008 and 2011, will be extensively monitored during operation at the test site. 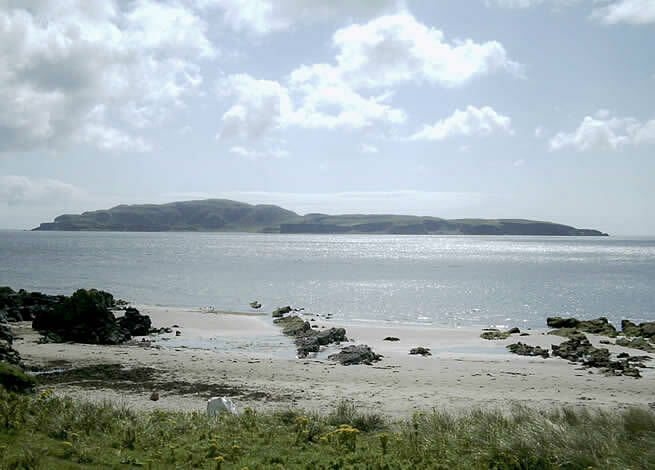 This particular location within the Sound was specifically selected for its tidal flow and wave environment, which is roughly equivalent to a scaled-down version of conditions in the Pentland Firth. The unit has a turbine diameter of 4.5 metres and weights 12.5 tonnes. Sanda Sound is an important stretch of water for seabird feeding. In respect of this, Oceanflow has been monitoring the behaviour of different species over the breeding season in order to better understand the potential impact of the device on seabirds. Further investigations as to seabird interaction with the device will be carried out once it is installed. Oceanflow is in discussion with academic research bodies regarding collaborating on all aspects of tidal turbine performance and environmental interaction data capture and analysis in order to gain most value from the trials.